First of all a very “Happy Independence Day“. We got freedom in 1947, thereby it’s 63 long years of Independence. Many historic personalities inspired the common people to lead the freedom struggle & ultimately became successful on 15th August, 1947. So on such a special occasion discounts & offers are a must. BSNL (Bharat Sanchar Nigam Ltd.) has taken care of that point by coming up with ultimate offers for it’s users. Also, it has come up not with one, but five offers. As this month is very special, BSNL has started offering 2G/3G SIM cards for free. These will be GSM SIM Cards either 32K/64K. The problem with this freebie is that, it’s available only in the state of Tamil Nadu & Rajasthan. But I got an info from my friend that it’s available all over India. In case you want just visit the BSNL Customer care office. If you’re lucky, then you may get one. This offer will be available till the end of this month (31st August). General Plans (General I, 1p/sec, all@49,3G prepaid,General 120) Rs. 110/- Rs. 100/- 365 Days from the time of activation. Saral Anant Plans( SA-I, 1p/sec, all@49) Rs. 110/- Rs. 100/- 180 Days from the time of activation. If you’re lucky enough to know about Freedom to Talk, then you still have some time left to enjoy free local & STD calls. Free local & STD SMS’s from 11.00 PM of 14th August (Yesterday) to 6.00 AM of 15th August (Today). The duration which applies for Freedom to Talk & Freedom to Send SMS are same. So grab this offer fast. BSNL will offer Unlimited Internet Surfing for the full day today. So you can at least enjoy this for the whole day; even if you miss the Freedom to Talk & Freedom to Send SMS plan. Freedom to Talk & Freedom to send SMS are available for both 2G/3G & Prepaid/Postpaid Customers. Did you get Free 2G/3G SIM Card in your state ? If it’s different from TN & Rajasthan do leave a comment & share it. If it’s available there then it’s confirmed that, it is available all over India. I did search on their official site before writing this article, but had no luck in finding one. But you can trust these offers as many have tried it! Thanks for the comment Sathish.! 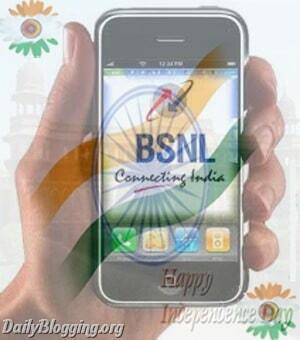 Today is holiday so definitely buy BSNL SIM on Tomorrow.